Mary Ann Lindley married Thomas Waddington. Her married name was Waddington. Mary Ann Lindley was born on 30 December 1813. She died on 10 September 1864 at age 50. [S698] Ella Bagwell Grave Stone, Find a Grave, www.findagrave.com. Sara Bagwell was born in November 1893 in Indiana. She was the daughter of John W. Bagwell and Louella Mary Watts. [S699] Fern Bagwell Grave Stone, Find a Grave, www.findagrave.com. [S694] Athel J Bagwell Grave Stone, Find a Grave, www.findagrave.com. [S695] Lelia V Vernon Bagwell Grave Stone, Find a Grave, www.findagrave.com. Almeda Jane McCallister was born circa 1884 in Indiana.1 As of circa 1901,her married name was Bagwell. She married George Franklin Bagwell, son of Hugh Washington Bagwell and Mary Jane Gouble, circa 1901. Almeda Jane McCallister and George Franklin Bagwell lived in 1910 in Fairmount, Grant County, Indiana. Almeda Jane McCallister died in November 1958 in Marion, Grant County, Indiana.1 She was buried at Estates of Serenity, Marion, Grant County, Indiana. [S717] Wilma C. Bagwell Grave Stone, Find a Grave, www.findagrave.com. Pearl Ethel Bagwell was also known as Ethel Pearl Bagwell. She was born circa 1902 in Indiana. She was the daughter of James Henry Bagwell and Louova D. Sater. [S686] Email from Kathy Bagwell dated January 15, 2008 to Hunter Wayne Bagwell - Subject Line: Ryan Neil Bagwell's Ancestors. [S688] United States Federal Census, Washington, District of Columbia, Population Schedule: Liberty, Howard, Indiana; Emuneration District: 146, Supervisor District: 9, Sheet: 1A, Dwelling: 1, Family Number: 1, Date: 1910. [S689] United States Federal Census, Washington, District of Columbia, Population Schedule: Liberty, Howard, Indiana; Emuneration District: 68, Supervisor District: 11, Sheet: 7A, Dwelling: 118, Family Number: 120, Date: 1900. [S687] World War I Draft Registration Cards, WW I Draft Registration: Parker Scott Bagwell, Roll: 1503900; Draft Board: 0. Nila O. Bagwell was also known as Nila Bagwell. She was born on 19 September 1887 in Indiana.1,2 She was the daughter of John William Bagwell and Sarah Ellen Carr.1 Nila O. Bagwell married Ernest L. Gerhart after 1900.3 As of after 1900,her married name was Gerhart. 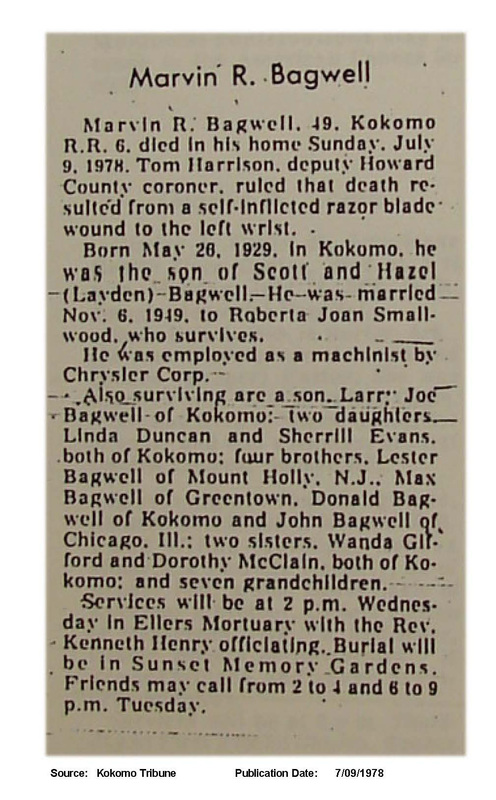 Nila O. Bagwell lived in 1938 in Huntington County, Indiana.3 She died on 4 March 1959 at age 71. She was buried at Greenlawn Cemetery, Greentown, Howard County, Indiana. 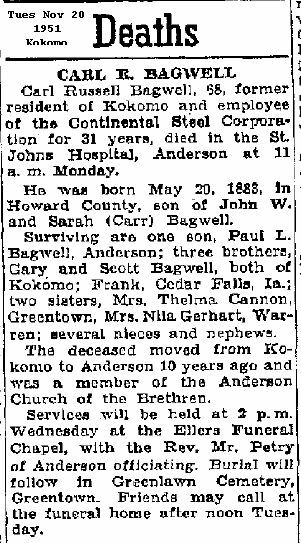 BAGWELL, Gary Falsom, son of John William and Sara Ellen CARR BAGWELL, was born near Greentown, Ind., July 4, 1882. He attended high school at Greentown one year. He was sent in the draft of Aug. 25, 1918, to Purdue University, and was transferred from that training school Oct. 27, 1918, to the ordnance section at Camp Hancock, Ga; then on Dec. 22 he was sent to Port Clinton Ohio, and assigned to Co. D, Erie Proving Grounds, and for a time before his discharge, July 31, 1919, he served in the military police. He was buried at Memorial Park Cemetery, Kokomo, Howard County, Indiana.